Nintendo announced what can only be described as a metric ton of information for upcoming software bound for both the Nintendo 3DS and Wii U this morning during their Direct presentation. Gamers who own either a Nintendo 3DS or a Wii U have a lot to be excited for, though 3DS users have much more so. A New Game in The Legend of Zelda Series: Nintendo developers are working on a new game set in the world of The Legend of Zelda: A Link to the Past, which launched for Super NES in 1992. The game makes use of the 3D abilities of Nintendo 3DS, and allows Link to become a drawing and move along walls. A 3D video of the new game is now available to download in the Nintendo eShop for Nintendo 3DS. The game is scheduled to launch this holiday season. You Are Not Dreaming – This is Real: Nintendo fans rejoice: EarthBound is coming to the Wii U Virtual Console this year. The original game was created by Shigesato Itoi and released on Super NES in 1995. Press the button below to read everything in full. Nintendo announced a whole lot of stuff over the span of 37 minutes. REDMOND, Wash.–(BUSINESS WIRE)– In a new Nintendo Direct video announcement today, Nintendo revealed another massive list of news for its Nintendo 3DS and Wii U systems. 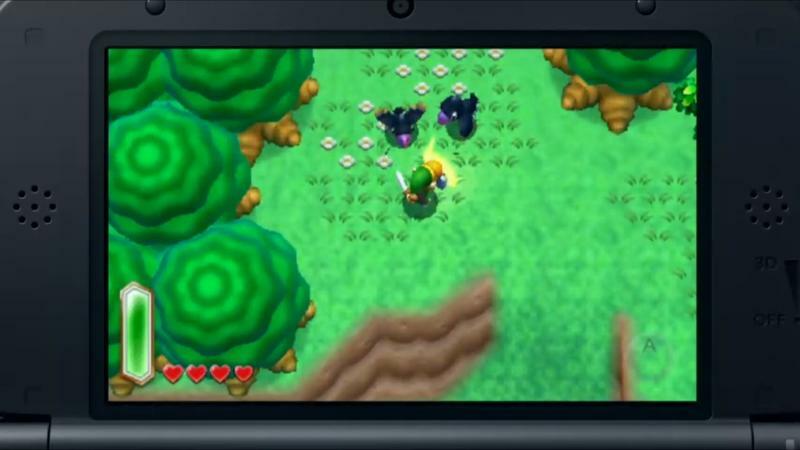 Topping the list for many gamers is an entirely new Nintendo 3DS game in The Legend of Zelda series set in the world of The Legend of Zelda: A Link to the Past. The game is scheduled to launch this holiday season. Fans will also be excited to hear that a new game in the Yoshi’s Island series is also being developed for Nintendo 3DS. And, after 20 years,EarthBound is finally returning to North America. The game is scheduled to be released this year on the Virtual Console service for the Wii U home console. Mario & Luigi: Dream Team: The game takes place on a mysterious island, and challenges Mario to go between the real world and Luigi’s dreams to rescue Princess Peach. The game will be available in stores and in the Nintendo eShop on Aug. 11. Donkey Kong Country Returns 3D: This hand-held update of the smash-hit for Wii adds eight new stages that players can enjoy after they have completed the main game, as well as a New Mode optimized for hand-held play with new items and mechanics. The game launches in stores and in the Nintendo eShop on May 24. Mario and Donkey Kong: Minis on the Move: This Nintendo eShop exclusive challenges players to place tiles on the bottom screen to guide the Mini Marios to their goal on the top screen. The game offers more than 180 stages in four different modes. Players can also create and share their own stages, and play those created by other players around the world. The game will launch on May 9. Animal Crossing: New Leaf Hardware Bundle: A special Nintendo 3DS XL system featuring designs from Animal Crossing: New Leaf that comes pre-installed with the new game will be available on launch day, June 9, at a suggested retail price of $219.99. Mario Golf: World Tour: Players who connect their Nintendo 3DS systems to the Internet can play competitive real-time multiplayer matches against others across the globe. They can also use the community feature to find others to golf with. The game is scheduled to launch this summer. The Legend of Zelda – Two Classic Games: The Legend of Zelda: Oracle of Ages and The Legend of Zelda: Oracle of Seasons will soon be available for the first time since their original release on Game Boy Color in 2001. Originally developed by Capcom, the games are headed to the Virtual Console service for Nintendo 3DS. The games are interconnected: Playing one unlocks secrets in the other. The games are scheduled to launch in the Nintendo eShop on May 30. Bravely Default: This role-playing game from Square Enix adds a new risk-reward twist to the genre: Players can skip a turn in battle to do more damage in later turns. The game includes AR functions, multiple endings and unique wireless features. Nintendo has partnered with Square Enix to publish the game in North America in 2014. Professor Layton is Back: The third game in the second Professor Layton trilogy, Professor Layton and the Azran Legacy, includes more than 500 puzzles and is scheduled for a 2014 launch. A Nintendo eShop Trio from LEVEL-5: LEVEL-5 has assembled a collection of Japan’s top developers to create original games that will be headed to the Nintendo eShop for Nintendo 3DS soon. THE STARSHIP DAMREY, from Kazuya Asano and Takemaru Abiko, puts players in a suspenseful adventure where they will have to search for any information available to discover the truth about their circumstances. In BUGS vs. TANKS! from Mega Man creator Keiji Inafune, players control a tiny customizable tank in battle against swarms of giant bugs. In Kaz Ayabe’s ATTACK OF THE FRIDAY MONSTERS! A TOKYO TALE, players will take the role of a young boy who lives where the giant monsters from Japan’s 1970s TV shows come to life every Friday. Shin Megami Tensei 4: When this game launches on July 16 from ATLUS, every copy in the initial shipment will be a Limited Edition Box Set that includes a 176-page Strategy & Design Book containing the official starter strategy guide and full-color artwork ranging from concept art to in-game pieces to never-used designs; the Shin Megami Tensei Music Collection CD that offers tracks specially selected from across the 20-plus-year history of the SMT series; and a deluxe-sized Collectible Slipcase featuring key art designed by character designer Masayuki Doi. New Super Luigi U: Wii U owners who purchase this downloadable content for New Super Mario Bros. U (a copy of the game is required) will get 82 updated stages and a new adventure featuring Luigi, who can jump higher than Mario, yet has trouble stopping after a dash. Many stages start with only 100 seconds on the timer, and quicker stages are populated with many obstacles. New Super Luigi U is scheduled to be released this summer during the Year of Luigi. System Update: Next week’s update will add new functions and enhance existing ones. It shortens loading times when switching between applications or returning to the Wii U Menu. New Features: Shortly after the system update, Nintendo will launch the Virtual Console service and Wii U Panorama View. Game & Wario: Each game in Game & Wario uses the Wii U GamePad in a unique way. Game & Wario will be available in stores and the Nintendo eShop on June 23. Monster Hunter 3 Ultimate Update: A game update for the Wii U version of Monster Hunter 3 Ultimate from Capcom is now available for download. The update enables off-TV play using the Wii U GamePad, and allows players from North America and Europe to join each other’s online games. A selection of videos introducing players to the game’s game-play mechanics can be found at http://www.YouTube.com/Nintendo. Remember that Wii U and Nintendo 3DS feature parental controls that let adults manage the content their children can access. For more information about this and other features, visithttp://www.nintendo.com/wiiu and http://www.nintendo.com/3ds. About Nintendo: The worldwide pioneer in the creation of interactive entertainment, Nintendo Co., Ltd., of Kyoto, Japan, manufactures and markets hardware and software for its Wii U™ and Wii™ home consoles, and Nintendo 3DS™ and Nintendo DS™ families of portable systems. Since 1983, when it launched the Nintendo Entertainment System™, Nintendo has sold more than 4 billion video games and more than 651 million hardware units globally, including the current-generation Wii U, Nintendo 3DS and Nintendo 3DS XL, as well as the Game Boy™, Game Boy Advance, Nintendo DS, Nintendo DSi™ and Nintendo DSi XL™, Super NES™, Nintendo 64™, Nintendo GameCube™ and Wii systems. It has also created industry icons that have become well-known, household names such as Mario™, Donkey Kong™, Metroid™, Zelda™ and Pokémon™. A wholly owned subsidiary, Nintendo of America Inc., based in Redmond, Wash., serves as headquarters for Nintendo’s operations in the Western Hemisphere. For more information about Nintendo, please visit the company’s website athttp://www.nintendo.com.